Letter of Solidarity with Greek Rebels! We are writing as a group of world citizens to tell you that we are saddened by yet another police murder of a young person, Alexis Grigoropoulos. We do not see this as an isolated incident by one “bad cop” but as the direct result of a oppressive police force and repressive state. Alexis’ murder sparked a fire in Greece and has touched many all over the world. We are heartened by the response of our Greek comrades and write this letter in support of what has become a large-scale popular uprising in Greece with support worldwide. We applaud its principles and its targets - the police themselves, and the state institutions that create and feed the system of violence and oppression that they enforce. We will stand strong in whatever ways we can with the people of Greece who are making their voices heard. This struggle does not belong to Greece alone. The problems of Greece are problems of a deeply repressive capitalist world order. 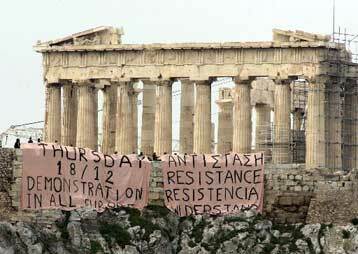 What is happening on the Greek barricades is happening elsewhere and everywhere. We hope that the fruits of our struggles and uprisings will yield a better and more just world for all. The time has come and the people will not back down.